Stock wheels with our custom matte black finish. There are many considerations when choosing a custom finish. Wheel design and size, the color of your vehicle, texture and more. Often, it helps to have some reference photos to best communicate what you are looking to accomplish. Contact the Rim Doctor Custom Shop and let us help you find that perfect fit. This is now a true one-of-a-kind ride. 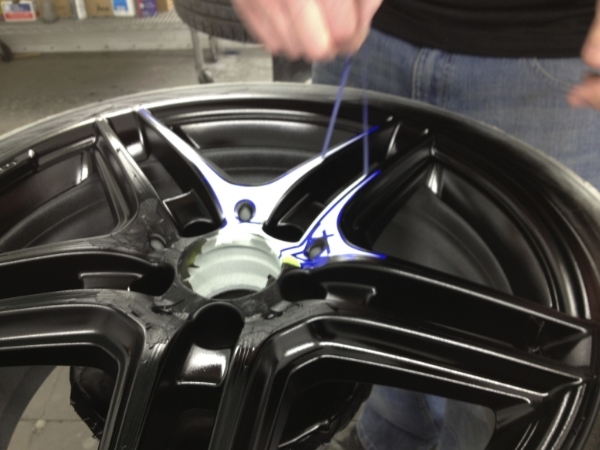 Due to the wide variety of considerations in any custom wheel refinishing job (ie. wheel type, color, clear coat type, special effects paints, precision masking, etc), pricing is always finalized once the actual specifications are agreed on. However, if you are looking for just a color change, pricing runs pretty closely with our refinishing price of $500/set. NOTE: For Custom Shop jobs, email is the preferred method of initial contact. If you are unable to email, please fill out the form below as completely as possible so that we can begin actualizing your custom wheel job. Remember, it is impossible to advise you accurately without clear photos of your wheels. If you have seen something in a photo that you like, send it through as well! If you would prefer to speak to a a Rim Doctor Tech in person, please stop by our shop anytime Monday-Friday 8am - 5pm and we would be happy to work with you in person.